Sub-Saharan Africa will add more than 16 million pay TV subscribers between 2018 and 2024 to reach a total of 45.63 million, according to Digital TV Research. 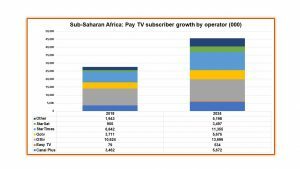 The company’s ‘Sub-Saharan Africa Pay TV Forecasts’ report predicts that subscriber numbers will climb 61% over the forecast period but that pay TV revenues will increase by just 42%, indicating lower revenue per user. “Pay TV revenues will reach US$7.72 billion by 2024, up by US$2.3 billion on 2018,” said Simon Murray, principal analyst at Digital TV Research. Multichoice is tipped to remain the region’s largest pay TV provider by subscribers. By the end of 2018, Multichoice’s satellite service DStv and digital terrestrial platform GOtv had 14.34 million subscribers combined. This is expected to grow to 19.37 million by 2024. StarTimes and its subsidiary StarSat are tipped to experience the biggest regional growth, increasing their subscriber count from 7.75 million people at the end of 2018 to 14.85 million by 2024. Meanwhile, Vivendi’s Canal Plus satellite platform and Easy TV DTT platform had 4.01 million subscribers at the end of last year and will reach 6.21 million by 2024, according to the research. Overall, these three leading TV groups accounted for 93% of Sub-Saharan pay TV subscribers in 2018, but their proportion of the total market is expected to fall to 89% by 2024.